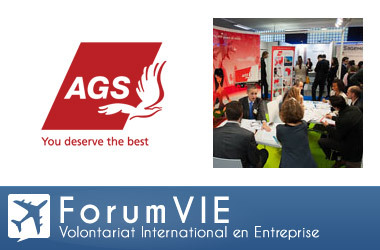 AGS was one of a number of top international businesses searching for bright and ambitious young people at the 12th ICV Forum (Forum VIE 2011), in Espace Charenton, Paris, on 12 October. The annual event aims to bring potential International Corporate Volunteers (ICV) candidates and businesses together for career opportunities in a variety of industries. The popular event welcomed 1900 visitors this year, including business school and university students, engineers and young people from many other vocations. AGS seeks ICV candidates for positions to be filled throughout the Group every year. Over 180 young professionals have worked at AGS as part of the ICV programme over the last 15 years. Many of these have gone on to begin their careers as senior operations executives in the AGS Group.